Demario Davis had assumed it was over. So did Josh Norman. But like so many in this country, both NFL players were shocked to learn that life in Flint, Michigan, still had not returned to normal. The water crisis remains ongoing. The first-hand accounts from local residents painted a potentially bleak picture for an impoverished community that has lost faith in its local government. Their stories were hauntingly similar — those of families still in need of assistance, still struggling to survive, still waiting in vain for clean tap water. It’s a little past 7 a.m. Tuesday when Davis recounts the stories of the poor, the overburdened, the forgotten. Young children, pregnant women and old people unwittingly drinking contaminated water. There was even the tale of a heartbroken boy who had encouraged his sister to drink water instead of sugary juices, only to learn that he had been “poisoning” his younger sibling all along. Davis detailed the dizzying array of issues plaguing a city that has been polluted by insidious corrosion in many forms. “It’s almost like Russian roulette: Do I have lead in my water or not? 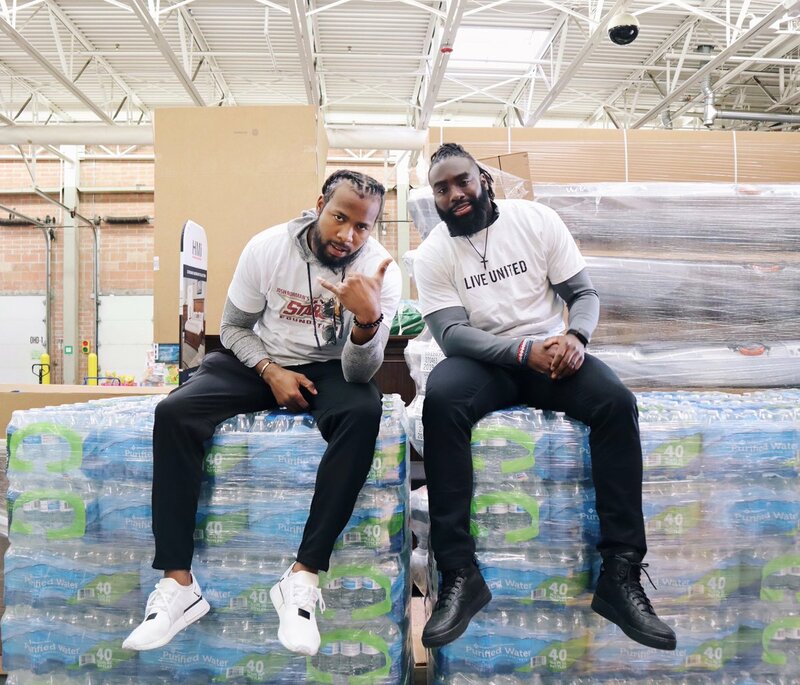 They have no way of knowing,” said Davis, who arrived in Flint Monday morning with Norman, the Washington Redskins’ star cornerback, for their 48-hour mission. The pair — which generated headlines last June when they flew to San Antonio to give out backpacks, books and toys to children who had been separated from their parents near the United States-Mexico border — partnered with the United Way in order to create a project fund to assist Flint’s 96,000 residents. Told that one truck delivers 2,000 cases of water three times a week (on Mondays, Wednesdays and Fridays), Davis and Norman met with locals for two hours on Monday and loaded up a rented U-Haul truck with about eight pallets, each of which carried 50 cases of water. “We wanted to know what it was like to live in Flint,” Davis said Tuesday morning, before they visited local schools and delivered water to families and residents who are unable to drive to the truck sites on their own. It’s unclear when this nightmare will end for Flint residents, but one thing is clear, Norman stressed. Davis and Norman are no strangers to community outreach. As members of the Players Coalition — a task force comprised of 12 NFL players aiming to impact social justice and racial-equality reform at federal, state and local levels of government — both players routinely use their platforms and their resources in an effort to effect change in various communities. That’s what led the pair to peruse the aisles of a San Antonio Walmart at 3 a.m. last summer. They spent those early morning hours filling up carts with toys and book bags they later donated to immigrant children who were separated at the border from their parents and later released from family detention centers. In response to President Donald Trump’s “zero-tolerance” immigration policy — which resulted in more than 2,500 migrant children being separated from their parents at the border — Davis and Norman felt compelled to act.